On the first play from scrimmage, Cedric Griffin swatted away a pass on a slant route intended for receiver Golden Tate, a difficult play that gave us a glimpse (or should I say, Flash?) of what appears to be another remarkable recovery from an ACL injury. Though Chris Cook improved from last week and Marcus Sherles rocked it, I’d hate to have to depend on Cook and Asher Allen on a continuing basis. So it was nice to see Griffin appears in fine form. Jared Allen gets a free shot on TJax and whiffs? Please. E.J. Henderson looked awfully fast out there and played a key role in the pick Sherels returned for a touchdown, as his tackle of the receiver forced the tip that created the opportunity for Sherels. 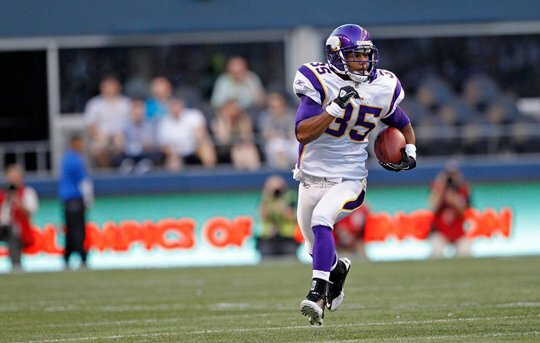 The play showcased not only Sherels’ speed but also his field awareness and his quick reflexes. He had a split second to pluck that ball from the air and then he was off before most people realized there had been a pick. We’ll see how he performs the rest of the preseason but I do hope he challenges Allen for the dime spot. Chris Cook had Sidney Rice in coverage plenty and held up fine. But it must be said that Tarvaris Jackson was the quarterback. And as awesome as the second team’s goal line stand was, how did you let Jackson drive his team all the way down to the one yard line? That’s gotta be a bit embarrassing. Even so, to see the defense stop them four plays in a row with Fred Evans and Letroy Guion playing the middle has got to give Vikings fans encouragement, especially given the looming four game suspension for Kevin Williams, and potentially more ominous, a foot injury that he is currently getting checked out. Mistral Raymond, the safety who has generated a lot of buzz during training camp finally made it on the field and had his chance to justify the hype on a long toss to Sidney Rice with Cook trailing in coverage but he let a certain pick go right through his arms. Dude. Cornerback Cord Parks made a nice tackle on special teams and had great coverage by swatting the ball away on another play but dropped two interceptions. Both were tough plays but both we catchable. Even though Tarvaris Jackson managed to take his team down the field to the one yard line, Darrell Bevell did have him execute a lot of bootlegs and screens, which we’ve seen plenty of from Jackson during his time here. That’s his comfort zone. We also saw him throw a long ball to Sidney Rice out of bounds, so still no accuracy on that throw. And his field awareness left a lot to be desired during one play where the Vikings had 12 men on the field yet Jackson didn’t call a quick snap to get catch the Vikings in a penalty.